Works very well, easy to use and looks great. Very solid, and has some nice features like the food steaming and crisping facilities. It is very bulky - if your kitchen is small, then you may well wish to purchase a smaller kitchen appliance. The controls can be slightly confusing at the start, although it din't take too long to grasp. It's fairly obvious that Whirlpool Jet Chef JT366 SL microwave isn't the cheapest combi microwave available; most people would consider the price tag to be quite an investment - however you get a lot of microwave oven for your money, as we will outline below. The first thing to point out is the size - a huge 31 litres, and having a weight of around 25.6kg, it certainly isn't small. It measures a total of 48.7cm by 37.7cm by 54.1cm - so it might be worth measuring your kitchen to make sure it fits before considering buying it. On the plus side, you won't need to be concerned about whether your favourite dishes will fit inside, as with it's 36cm turntable there's plenty of room to spare. This combi microwave is obviously designed for use in larger households - it's built to last, and caters for larger dishes and plates with ease. In terms of design it is almost industrial, both in size and style, with a contrasting black and silver (or "Satina Mist" as the manufacturer refers to it!) modern colour scheme. The backlit blue display is crisp and simple to read - no complaints here. Onto the controls - initially these are a little bit daunting, simply as there are very few text labels, and instead are marked with symbols. Upon consulting the manual, we got the hang of operating the JT366 SL, but it is worth mentioning that this microwave might not be wholly appropriate for those who struggle to grasp technology - if this is the case, then you might want to look for a combi model with a better labelled menu system or simply one with less features. Having said that, shortly after looking at this model, all of our testers found it to be simple to operate - once you get the hang of which button controls which function then life becomes a lot easier. Speaking of features, another reason to look into buying this model is the unique steam facility - ideal for the health conscious amongst us, giving you the clean living option of healthy vegetables, meat and fish. The crisp plate also works very well, enabling you to cook essentially anything that'll fit inside, such as the slightly less healthy options of pizzas and quiche! One of our testers remarked that you'll find yourself using your traditional convection oven less frequently if you purchase this item, which will save you money (Due to the fact that although this microwave is large, it is still somewhat smaller than the average oven and will take less energy to heat up). Another sadly often overlooked function is the Jet Defrost, which in our experience works as effectively as Panasonic's Chaos or any other high performing system on the market. The sturdy microwave door has the hinge located at the base, which provides the added bonus of a shelf upon opening - making removing hot food for inspection both safer and easier than a normal side opening microwave. Our testers found this useful, especially when handling hot dishes straight from the oven, without risking leaving an annoying burn mark on your kitchen work surface. So what did we make of the 1000w Whirlpool JT366 SL overall? 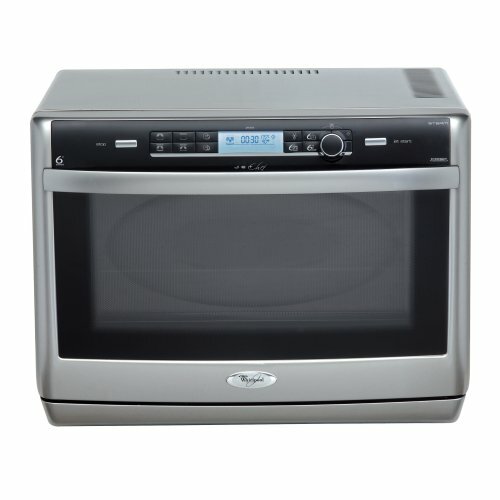 Essentially it is a large yet highly versatile silver microwave, which will transform your usual cooking methods, combing a microwave, steamer and grill - it's cheaper to run than an oven, easy to operate, and cooks food uniformly. The steam and crisp functions work as intended, and although at the very start we were a bit puzzled by the controls, once we had performed a few basic operations it all fell into place. 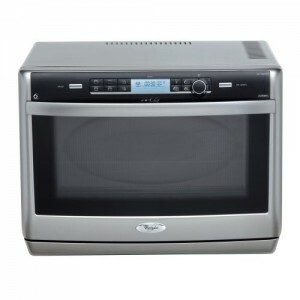 A very well made Whirlpool microwave, which although expensive, represents an excellent investment in the long term. Yes, it is very large, but will ideally suited to those with larger families. If you need a large microwave with a variety of features, then this is the model for you. Whirlpool's Unique Crisp System browns and crisps, requiring very little fat or oil. The "6th Sense" Steam accessory and Auto control system help to provide easy and healthy steaming. Quartz Grill feature provides a faster and more efficient grilling experience. Jet Start, One touch operation means there is no need to set the power level and time period separately. The built in 3D distribution system gives even heating throughout the cavity, resulting in uniform cooking. The vertical drop down door also doubles as an extra shelf for the food. The huge capacity of 31 litres provides enough room for the largest of families. When using "Jet Defrost", the 3D distribution system defrosts up to seven times faster than a conventional microwave oven. 8 different power levels for different food types. Top controls and display for easy usage.